Hello Darlings, My weekend away with my SPG Amex Card in South Beach proved that during the daytime, South Beach is leisure central, but once the sun sets the beach truly comes to life. As this is a final part of my South Beach getaway, please check out the first here. There’s a plethora of opportunities to participate in, whether it's lavish dinner parties or going out to a night club with your friends. Here is a recap of my favourite evenings out while exploring South Beach. One of the best perks of being a Starwood Preferred Guest from Amex Cardmember is the many ways I can use my Starpoints. Not only did I use my Starpoints to book my flight and hotel stay, but at the end of my stay at W South Beach, I was able to use my leftover Starpoints to settle a big part of our room service charges. Another highlight and unique offer that comes along with my SPG Amex Card is their Instant Awards program. Cardmembers can cash in their Starpoints for free dinners in the hotel restaurant or even spa days. While in Miami, my girlfriends and I created an agenda, most evenings began in the hotel lobby with a few cocktails and chatting with other guests at the SPG property, the W Hotel South Beach. We made some amazing friends over the weekend, which led to an even more amazing experience. Making friends with fellow travelers has always been a priority of mine, it leads to many nights filled with spontaneous decisions and lasting memories. Thanks to my Starwood Preferred Guest Credit Card from American Express, we had the help of Gabriella Di Falco to make our evenings in South Beach even better. She is the Lead Insider and concierge at the W South Beach. It would be a colossal understatement to say that without her help my experience would not have been the same. She knew exactly where to send us every night and her ability to perform last minute miracles got us access to all of the best shops and dinner reservations at the most coveted restaurants in Miami where I used my SPG Amex Card to rack up my Starpoints. She was our South Beach fairy godmother. 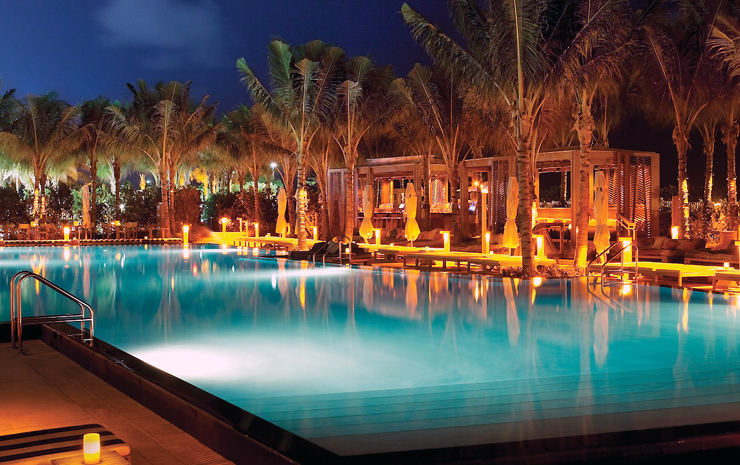 W Hotels are known for their in-the-know W Insiders but the W South Beach took it to a whole new level! Amongst the many stops on my Miami must try restaurant list, I think that Prime One Twelve was my favorite restaurant followed by Baoli which had an awesome atmosphere and vibe. The W Hotel South Beach also has a Mr. Chow restaurant which was one of my go-to’s on vacation. What comes after dinner? Dancing! When it came to dancing the night away, my favorite spots were Liv at Fontainebleau, Wall at W South Beach, and Mokai! Looking to plan a weekend away? I suggest putting all your spending on a single credit card like the SPG Credit Card from American Express so you can rack up your Starpoints quickly and make your dream vacation a reality. *in collaboration with Amex Bank of Canada. The views and opinions expressed are my own.